It was a dream come true for Boon Kean Hoe when he found out that he had won the coveted High Achievers Scholarship to further his studies at the University of New South Wales (UNSW), Australia – giving him the opportunity to follow his education dreams and ease his family’s financial commitments in sending him overseas. The UNSW Business School International High Achievers Scholarship, valued at AUD$10,000 is a merit-based scholarship that is made available to undergraduate applicants from eligible pathway partner institutions in Hong Kong, Indonesia, Malaysia, Singapore and Vietnam. Kean Hoe was pursuing the Australian Degree Transfer Programme (Commerce) at INTI International University when he applied for the scholarship and was selected to continue his studies in the Bachelor in Commerce (majoring in Accounting) programme at the UNSW campus in Sydney, which he began in February 2018. 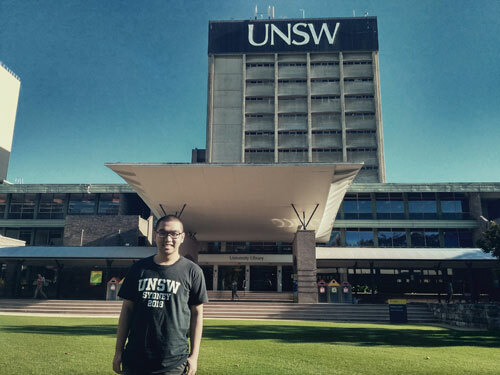 Having spent a couple of months settling into his new home, Kean Hoe shared, “Studying at the University of New South Wales has already been a wonderful experience! The community is friendly and I have gained access to resources that are truly world-class. I continuously receive support and assistance from almost everyone here, from the volunteers at the Student Development Office, to my lecturers and tutors. Established in 1949, UNSW is ranked 3rd in Australia, 45th in the world, and 1st in New South Wales according to the 2017 QS World University Rankings, and is one of numerous world-class universities to which INTI students have transferred to from across various programmes, including the University of Oxford, the University of Cambridge and the Massachusetts Institute of Technology.